Union Minister of State for Agriculture & FW, Shri Gajendra Singh Sekhawat led an Indian delegation comprising Dr OP Chaudhury, Joint Secretary, Department of Animal Husbandry, Dairying & Fisheries and HK Suanthang, Director, DACFW, to participate in the Agriculture Ministers� Conference held on 20.01.2018 in Berlin, Germany during the 10th Global Forum for Food and Agriculture, says a release. The Conference, organised with the theme of �Shaping the Future of Livestock � Sustainably, Responsibly, Efficiently� was attended by 69 agricultural ministers and heads of 6 international organisations including FAO, WTO and World Organisation for Animal Health (OIE). A Communiqu� was issued by the Ministers to safeguard the supply of and access to sufficient, safe, nutrients and affordable food from livestock production for the growing world population. Union Minister of State highlighted India�s impressive performance in the dairy, meat and poultry sector and the initiatives taken by India in the field of diseases control and animal welfare. Shri Sekhawat also stressed the actions taken by India to mitigate the effect of climate change, both in the animal and crop sector and called upon the developed countries to abide by the principles of equity but common and differentiated responsibilities towards tackling climate change. Shri Sekhawat accompanied by the delegation also utilised their visit to Berlin for meeting Agriculture Ministers from 3 other countries � Germany, Argentina and Uzbekistan. With his German counterparts, the two Ministers reviewed the overall relationship of the two countries in agriculture sector. Shri Sekhawat also impressed upon the German Minister to use his good office for early resolution of Indian rice export being subjected to arbitrarily fixed maximum residue Limit on Tricyclazole at 0.01 mg/kg by European Union. 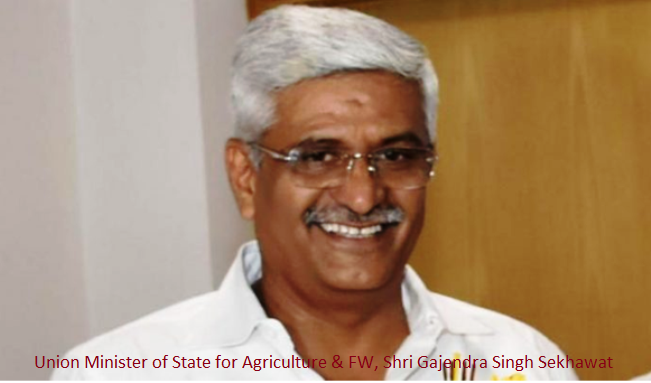 Union Minister of State mentioned EU�s non acceptance of digital phytosanitary certificates. The German Minister, in response, conveyed his admiration for India�s advance on digitalisation of the certificate and assured to personally take up the matter with the EU Authority concerned. During his meeting with Mr. Zoir Mirzaev, Uzbekistan Minister for Agriculture and Water Management, the MoS informed his counterpart about the priority areas of India in agriculture sector and suggested areas such as farm machinery, skill development and crop residue management as possible areas of cooperation. The two Ministers also discussed potential items of trade such as moong beans, and opportunities for available investment in each country. The discussion was further supplemented by the two Ministers taking a walk through the various exhibitions of the Uzbekistan stall. Shri Shekhawat also met the Argentinean Minister of Agriculture Dr Luis Miguel Etchevehere and discussed various areas of mutual interest including trade in agriculture products such as fruits, vegetables and meat. The Minister also conveyed India�s interest in the success achieved by Argentina in farm mechanisation. He also sought collaboration to such technologies to suit Indian conditions, and obtained technology for manufacture of silo bag to reduce storage losses in India.